Las Vegas, NV (March 3, 2009) Panasonic today introduced the DMC-GH1, the newest member of the company's revolutionary LUMIX G Micro System a new digital interchangeable lens camera system that delivers professional-level features and performance in a compact and easy-to-use camera body. Compatible with the Micro Four Thirds System standard, the new LUMIX GH1 features advanced video photography functions, such as the ability to record High Definition (HD) AVCHD 1080p/24p video. 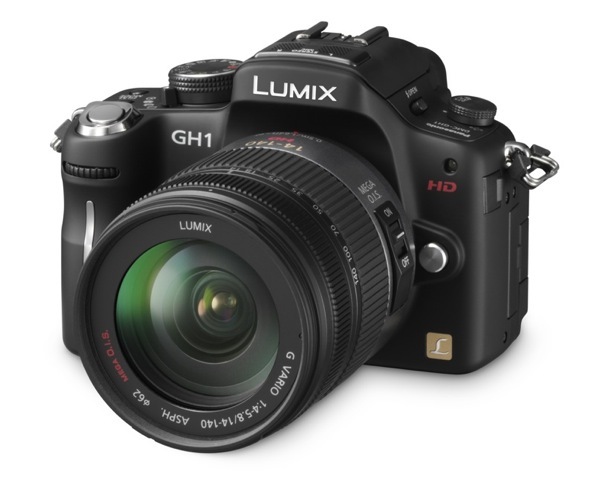 * In addition, the new LUMIX GH1 comes with a newly developed long-zoom interchangeable lens the LUMIX G VARIO HD 14-140mm/F4.0-5.8 ASPH./MEGA O.I.S. This lens was specifically designed to support HD movie recording and features a silent motor and continuous auto focusing (AF) capability; two features which distinguish the LUMIX GH1 from DSLRs that offer HD video recording capabilities. "Photographers of all levels professionals, amateurs and beginners will be stunned by the range of creative possibilities that the LUMIX GH1 creates in the world of high-quality photography and HD video. Users will be equally amazed by the camera's easy-to-use design and small size," said David Briganti, National Marketing Manager, Imaging, Panasonic Consumer Electronics Company. 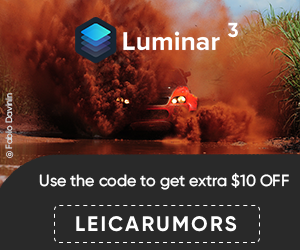 "Beyond its creative potential, the LUMIX GH1, a sister product to the award-winning LUMIX G1, is also innovative and differentiates itself from the pack by recording High Definition video with continuous AF, an indispensable feature for practical video recording." The new LUMIX GH1 provides cutting-edge video recording features, including the ability to record high-resolution full HD (1920 x 1080) video at 24 fps or smooth HD video (1280 x 720) movie at 60 fps using an AVCHD format (MPEG-4/H.264). The AVCHD format provides the important benefit of doubling the HD quality recording time compared with Motion JPEG. The LUMIX GH1 hosts a dedicated video record button on the back of the camera which lets users instantly start recording videos, even while shooting still photos removing the fear of potentially missing a must-see video moment. The LUMIX GH1 also records video in high-quality stereo sound via Dolby Digital Stereo Creator, the global standard of audio recording. An optional stereo microphone (DMW-MS1) is also available to achieve a more intensive sound recording experience. Finally, a convenient Wind Cut function is provided to help to block out distracting video background noise. Like the LUMIX G1, the LUMIX GH1 features the Live View Finder system which enables something that simply is not possible with conventional DSLR cameras the ability to preview the effects of camera settings (e.g., exposure, aperture, shutter speed) before taking the photo. This helps take the guesswork out of the camera setting process and helps users ensure that every photo they capture comes out exactly as they envisioned. The brilliant 1,440,000-dot equivalent Live View Finder system can also display information settings that a user can see without removing their eyes from the subject. Furthermore, a built-in eye sensor automatically switches on the viewfinder when the user looks into it, then switches it off and turns on the swivel 3.0-inch large 460,000-dot high-resolution LCD when the user looks away from the viewfinder. The 60-frames-per-second Live View is made possible by the Live MOS sensor, which takes real-time signals directly from the image sensor and sends them continuously to the LCD. Both the Live View Finder and LCD provide a 100% field of view allowing the user to accurately frame and compose a shot from most any position. The LUMIX GH1 kit lens the LUMIX G VARIO HD 14-140mm/F4.0-5.8 ASPH./MEGA O.I.S. provides a broad focal length range of 28-280mm (35mm camera equivalent) and supports continuous AF using the contrast AF system for both photo and movie capture. The low-noise lens design also seamlessly supports video recording by minimizing the mechanical sound generated by AF/AE actions. At the core of the LUMIX GH1 lies a newly developed 12.1-megapixel high speed Live MOS sensor and Venus Engine HD, which features twin CPUs for outstanding processing capabilities. The Live MOS sensor is capable of high-speed readout over four channels to be compatible with full-HD movie recording. This sensor is also advantageous for photo recording with a high signal-to-noise ratio thanks to the new circuit structure that is unaffected by the noise generated in each of the circuits. This results in crisp photos even those taken at high ISO levels. The multi-aspect type sensor allows users to take photos in 4:3, 3:2 or 16:9 aspect ratios with the same angle of view. The Venus Engine HD is also energy efficient, supporting long periods of AVCHD video recording on a single battery charge. In addition to the digital camera's HD video recording capability, the DMC-GH1 features the LUMIX Creative Movie mode which lets the user manually set the shutter speed and aperture, making their videos more creative and representative of their own personal video style preference. Changing the shutter speed gives the videos a special look, particularly suitable for shooting fast-moving subjects. Controlling the aperture is convenient when there are several subjects at varying distances, so the user can focus on the foreground and blur the background or vice versa. While the LUMIX DMC-GH1 has cutting-edge still image and video capture features, the LUMIX GH1 is also incredibly easy-to-use, thanks to Panasonic's iA (Intelligent Auto) mode** a user-friendly setting made popular in the LUMIX line of digital point-and-shoot camera products. Panasonic's iA mode is a suite of technologies which engage automatically (no settings needed). The latest addition to the iA suite of features is Face Recognition, a feature that directs the camera to prioritize focus and exposure on a specific face that that the user had previously registered in the camera. *** This invaluable function makes it especially easy to take sharp and beautifully exposed images of things the user values most in their photos the user's friends and family. After users capture their images using the LUMIX GH1, it's easy for them to enjoy their photos or HD videos immediately on a large-screen Panasonic VIERA high-definition television. All that is required is to remove the SD Memory Card from the LUMIX GH1 and insert it into the VIERA Image Viewer (SDHC/SD Memory Card slot) located in the VIERA HDTV or in the Panasonic Blu-ray disc player. Alternatively, an optional mini HDMI cable is available to output the images from the LUMIX GH1 directly to the Panasonic HDTV via VIERA Link. Then, using the VIERA HDTV's remote control, users can take advantage of the LUMIX GH1's advanced playback and slideshow features.